Feltmaking is one of the oldest textile traditions. 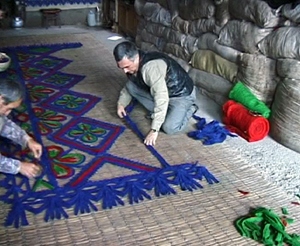 In Anatolia felt is still produced for the making of sikkes and kepeneks, saddlecloths, rugs and hangings. This ancient process uses the natural properties of raw wool to produce material with unique attractions and characteristics. Filmed in Konya,Turkey. Contents: Felting and patterning traditional design carpets, kepeneks (shepherd's cloaks) and the traditional tall dervish hats - sikke.